Tempers (NYC.USA) | Bilety na koncert | Łódź | Going. Tempers is: Jasmine Golestaneh, Eddie Cooper. 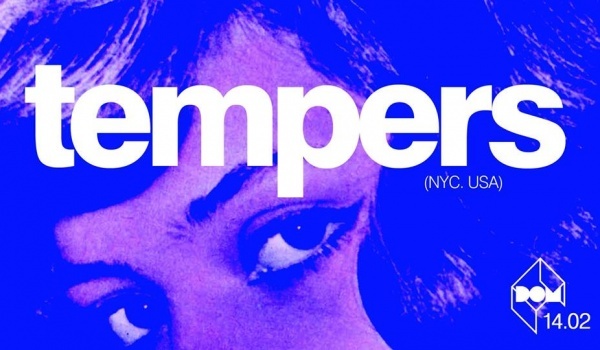 Tempers is a NYC-based post-punk/electronic duo comprised of Jasmine Golestaneh and Eddie Cooper. The duo's dark, ice-cold electronica blends a sinister slow static disco with danceable beats, a hinting of pop sensibility imprisoned in an almost gothic, industrial soundscape. Jasmine, born in Florida, is of Latvian-Iranian descent, and grew up in Paris and London before moving to New York. She has recorded and performed as musician for most of her life and her visual art, primarily collage, has been shown in galleries throughout New York. Eddie is a NYC native who spent years in Berlin, where he released records on electronic labels like !K7 and Eskimo. They started playing as a band in 2011 and began recording songs almost immediately as part of their songwriting process. Their previous singles, 'Eyes Wide Wider' b/w 'Hell Hotline' produced by Damian Taylor (Bjork), 'Strange Harvest' and 'Killing for Company' (Swans cover) received coverage across the US and UK blogs including Pitchfork, The Fader, Noisey, V Magazine and Interview. Their debut album "Services" was released in October 2015, and their EP "Fundamental Fantasy" was released via The Vinyl Factory Feb 2017. Tempers new album Junkspace, feat. Rem Koolhaas, was released in november 2018 on BMG. They will be touring Europe now.